Neon shoes are the hottest trend with kids these days. 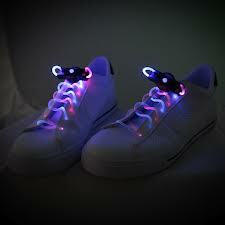 Having neon shoes that can light up and make you an instant star at clubs and parties are hot and in high demand. 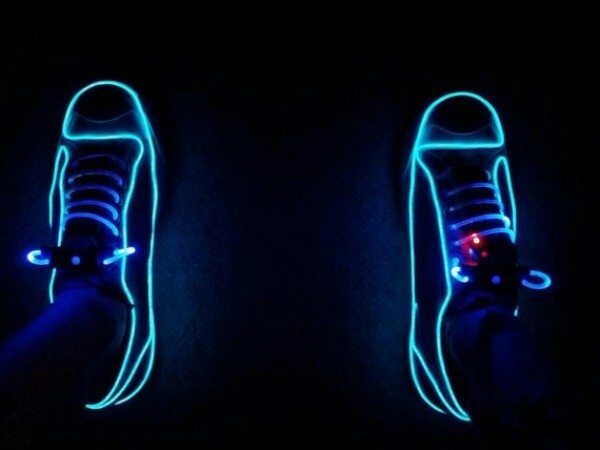 These neon shoes can be created with EL wire and are a great project for the creative types looking to add fun and style to their appearance. EL Wire is a thin cable, about the size of your mouse cord, that will light up in one of ten colors when turned on. 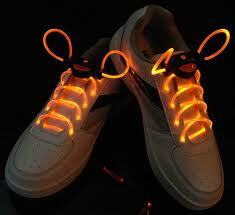 The most simple way to accomplish the neon shoe look is with EL wire shoe laces. This EL wire product is widely available on line from many different outlets, and is as easy as lacing up your shoes.EL wire have been processed especially, and is of characteristic of resistance of slip and pulling force.EL shoelace flash with your step. It is of same function with general shoelace-Lacing and fastening shoes, but make you feel vivacious with the flash light. Include 3pcs of AG13 Batteries. An active power lock to lock the shoelace. For more adventurous do-it-yourselfers, custom neon shoes will make you the baddest human on the dance floor. 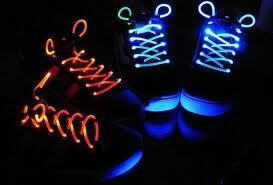 You can still use the EL wire laces as a starting point, but these shoes take it to the next level. What you decide to attach your EL wire to will ultimately dictate what tools and materials you will need. That said, the three main items in an EL wire project are the EL wire, the inverter, and the battery. The EL wire is a phosphor coated wire that illuminates when an AC voltage is attached to it. The inverter converts a DC voltage into the required AC voltage. The battery provides the DC voltage. These all need to be matched. For instance, I needed 50cm of EL wire for each shoe and the inverter I used needed to be able to work with this length. If the inverter is not powerful enough, the wire will be dim. Too powerful and it will damage the wire. Where you get your inverter from should be able to tell you the lengths it is rated for. The battery also needs to be the right voltage for the neon shoes inverter.